If you're going to build an iPad app, you shouldn't simply replicate your website or do so with the plain intention of increasing exposure to your content. With responsive design trends in full swing and the growing ubiquity of wi-fi networks, the likelihood an iPad user (or any tablet-toter for that matter) can already access your web content in a meaningful way is almost assured. Going native should be a decision based around leveraging the unique benefits of the device, particularly the physical and gestural aspects. Viget and Opower recently had occasion to venture down this path together, and arrived at an app squarely suited for the iPad. The inclination to replicate content in the app already on Opower.com was a sneaky, tough reflex to correct. And each time a suggestion to do so crept into the conversation, the common reply was “Well, that's already on the website.” Being able to quickly pull up a product demo or other online materials through the native Safari browser made the value of a custom iOS app seem less and less worthwhile. The only way the app would be successful and appealing was if it maintained a strict purpose and was meant solely for the iPad. 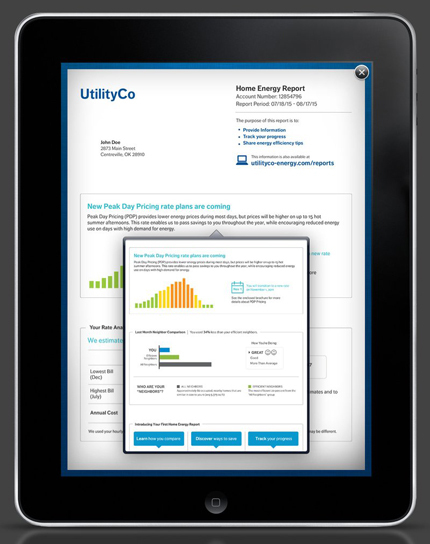 Opower is the industry leader and pioneer in providing customized, energy usage reports to consumers. The flexibility and tailored nature of these mailed reports is what makes them so useful and effective. If we were going to create an iPad app, we should design one that puts this valuable tool center-stage, and in a way particularly suited to the device. To put it plainly, we should build an app to do what paper can't. And so the Opower Reports app was born -- an interactive tool which condenses six months of paper reports into a single, three-minute long iPad experience. 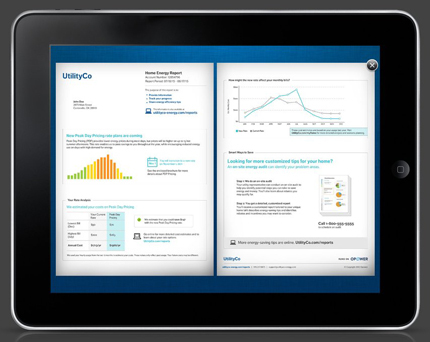 The app provides a similar feel as the printed reports -- the size of the report on the iPad, in fact, is very close to the paper version -- but users are able to tab through modules, view pre-configured versions (e.g., "Peak Season"), and swiftly understand the aggregate power of these reports. From a sales or media-demo angle, telling this story in paper form certainly isn’t as efficient (or eye-catching), and often proves cumbersome what with carrying around numerous printed materials or PDFs. Before you rush to the App Store, know that the Opower Reports app presently isn’t publicly available, and is instead primarily used by Opower's sales force; this narrow use allowed us to pair the app with some fun companions, essentially turning the entire device into an app of sorts. Accompanying the native Reports app are homescreen bookmarks (and custom icons) to frequently used resources, as well as a branded wallpaper. Recommended additional third-party apps help out where needed, as well. For instance, services like Box.net are leveraged for quick access to PDFs and other documents, and the built-in Videos program stores important Opower media clips.